Wooden rings need to fit well. If you only get one thing right when you make a ring, it needs to be the fit. No matter how beautiful the ring, a person will stop wearing it when the fit is not right. Here is how you can prevent that. 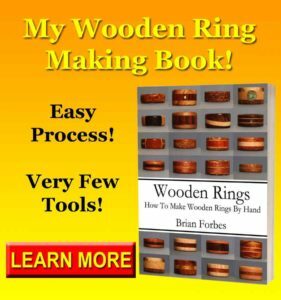 Wooden rings are very popular, and they are also easy to make. This means that just about anyone can make them. The real secret is making them fit. Fitting a ring is more than just drilling a hole. There are refinements that you need to make to the fit, and they will make the ring more comfortable to wear. After all, if a ring is too loose, it can fall off and break. It can also fall off and the person might not know it happened and lose the ring. If the fit is too tight, it can be uncomfortable, and get stuck if their hand swells a little. All of these are bad for your ring, because even the best ring in the world will end up in a drawer if the fit is poor. Here area few ways that you can save your rings from this fate. It all starts with the drill. When you drill your ring, make sure that you drill with the closest possible drill bit to the ring size. Make sure that you stay under final size though, and if you have to split the difference, always choose the bit that is a little smaller. The reason you can’t go better and make it work is because you can’t put wood back. Once it’s gone, it’s gone. 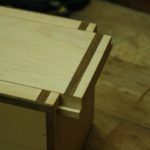 If you over drill the ring, and the opening is too big, you might be able to glue in a piece of veneer, but that will still add time to the build. The reason that you want to drill as close as you can is because sanding the inside of the ring is a pain sometimes. The closer you are, the more likely that you will complete the process without letting it stop you too early from frustration. The way to widen out the ring opening is to sand it. You can do this by hand, or you can do it with a sanding drum or Dremel tool. Either way, the point of sanding is to sneak up on the actual finger size for the ring. It’s easiest to do this process with a mandrel, or some other reference for the needed size. A half a millimeter is hard to see, and even harder to mark on the ring. You need to have a ring sizing mandrel to measure the right fit. Sand the inside of the ring, and test it on the mandrel. Do this often. It’s much better to burn a little time testing too often than it is to sand right through your target size and make the ring too big on accident. 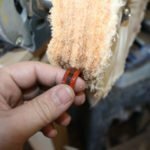 If you are really close, and your customer just wants the ring to be a pinch looser, you can sand a comfort fit instead of sanding everything. A comfort fit is just rounding the inside edges of the finger opening so that they meet the outside faces of the ring in more of a graceful bend rather than a ninety degree angle. Look at a comfort fit ring, and you will see that the inside opening is not flat. The middle of the ring is the actual size of the drill, and the two edges are rounded over, which in effect makes thee areas wider than the ring size. On rings, a comfort fit style makes a smaller ring fit on a bigger finger. Most comfort fit rings run half a size smaller, so if you are a 10 normally, you re a 9.5 in a comfort fit. This is an easy way to open up a ring a little bit, and make the fit feel more comfortable. If you are selling your rings one at a time, arrange a meeting for a test fitting. Customers love individual attention like this, and it shows then you care about their happiness. It also gives you access to the exact finger that you have to impress. When you test fit the ring, bring a few more with you of different sizes. Try the actual ring, and ask a lot of questions. Make sure that you get from the customer their exact thoughts, and how they feel about the ring. If the ring needs to be smaller, you can add some veneer and try again. If it needs to be bigger, you can sand the ring and taper the inside edges on both sides, and try the fit again. If you are really close, you might be able to get the fit perfect right at that meeting. Once you have their approval, bring the ring back to the shop for the final touches. It’s important that the ring be as close to final size when you do the test fit though. This is because you want the feel to be as close to normal as possible. This way, they won’t feel something different when you drop off the final product. Your homework is to get serious about fitting your rings. 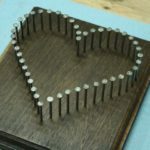 If you are the kind of woodworker that drills the rings with a few bits and leaves them alone, try a custom fitting. 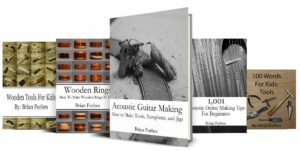 It will challenge you, and make you a better ring maker. 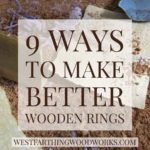 If you are making hundreds of rings and dumping them in a basket to sell, that’s different. In this case, you are not making custom fittings. However, even those rings will benefit if you get more drills in between the sizes you have, and make more sizes available to your customers. It’s not difficult to sand the inside of the ring when you get really close with the drill bit. 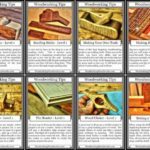 Get as close as you can, and then sand the rest. Arrange a meeting and do a test fitting, then take that information back to the shop to complete the project with a perfect fit. Of all the things that prevent a ring from being worn, the fit is the biggest reason. A ring that fits poorly is not fun to wear. It can slip around, get stuck, or fall off for no reason. Instead, put your time into the fit, and the rest will work out. If you make two rings, a great looking piece that fits poorly, and an average ring that fits really well, the average ring will see more daylight than the better looking ring. If you start with the fit, and then work on the design, you can guarantee more exposure of your work. The best way to do this is with a test fitting. However, if you can’t, then use a mandrel to get the size dead perfect. Take your time, and make sure that you don’t stop working on the ring until you know that it will fit well. 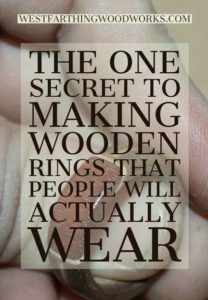 If you have any questions about The One Secret to Making Wooden Rings that People will Actually Wear, please leave a comment and I will be glad to answer them. Happy building.